Allow Transport Media to promote your brand in front of millions of influential passengers from across the globe by advertising in Europe’s busiest airport. London Heathrow Airport advertising offers your business a unique and exciting opportunity: to advertise your brand in front of an international audience of millions from around the world. One of the world’s top three busiest airports, London Heathrow welcomes millions of passengers through its gates each month, including high-flying business executives, celebrities, investors and tourists. As the busiest airport in Europe – and the third busiest in the world – advertising in London Heathrow Airport positions your brand in front of millions of international and domestic passengers. In 2014 alone, London Heathrow handled a total of over 73 million passengers. Your business could make an instant impact on those arriving into the UK, influencing future purchases, encouraging investment and improving brand awareness in front of a global audience. Advertising in Heathrow Airport UK allows you to target passengers flying to and from destinations across the world. As a hub for both British Airways and Virgin Atlantic, London Heathrow operates countless international flights, with over a million passengers arriving and leaving the airport each week. Many of Heathrow’s flyers are business executives and influential decision-makers arriving into the financial capital of Europe. By advertising at London Heathrow, you can ensure that your brand makes a big impact on this key target audience. By targeting specific terminals, gates, lounges and shops, Heathrow Airport advertising allows you to appeal to the perfect audience, whether you’re looking to make an impact domestically or globally. 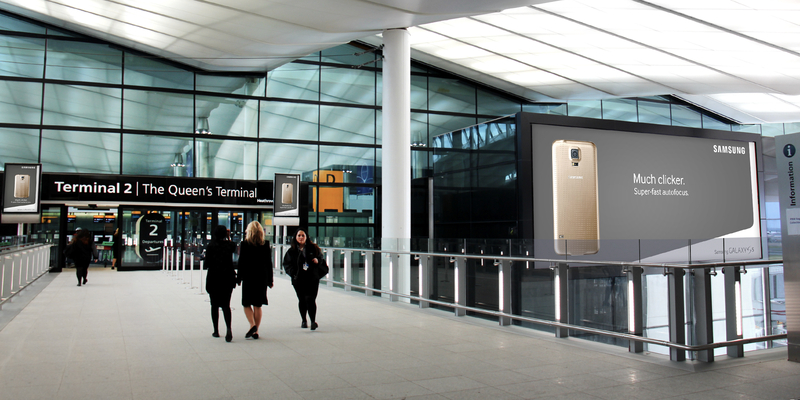 With a range of advertising formats available inside the airport, advertising in Heathrow Airport gives you the chance to target passengers in a captive environment with high dwell time. The airport continues to grow, with plans for a new runway approved. This could see your ads reach even more influential and international passengers. With an extensive range of shops, bars and restaurants located inside the terminal buildings, Heathrow Airport shopping advertising can encourage flyers to make instant purchases when they have time to kill and money to spend. With London undeniably the financial capital of Europe and arguably the world, London Heathrow Airport advertising provides an opportunity like no other to reach a lucrative business-focused audience, many of whom have high influence and purchasing power. As a city, London is one of the world’s most popular tourist destinations, with attractions such as Buckingham Palace, Westminster and more bringing in millions of visitors from around the globe who would all be exposed to your advertisements. If you’d like to know more about advertising in London Heathrow Airport, get in touch with our team at Transport Media. We work with a range of formats including billboards, digital billboards, shuttles, taxis, transport, interactive media and other airport advertising media to ensure that your Heathrow Airport advertising campaign is as effective and as memorable as it can be. You can get in touch with us today over the phone or via our handy online contact form.